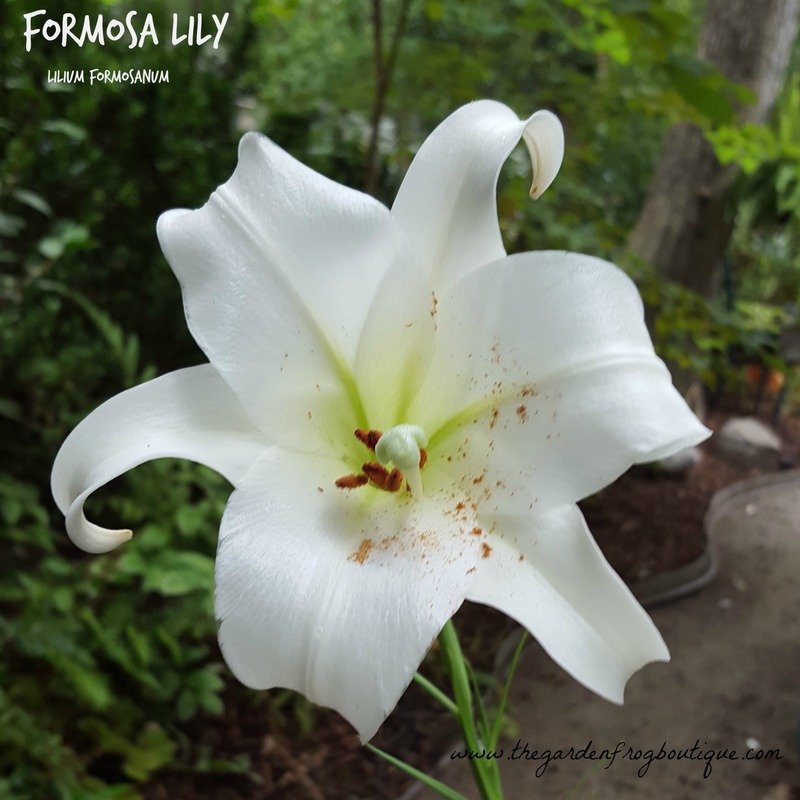 I added the Formosan lily (formerly known as Formosa lily) L. formosanum in late summer of 2015 after attending the fall plant sale at the Lewis Ginter botanical garden here in Richmond Virginia. As I walked up to the large white trumpet shaped flower, I could smell the heavenly fragrance. I stood there inhaling the intoxicating aroma and got lost for a moment. The grower told me that the plants he was selling were sown from seed this spring and they are easy to grow. 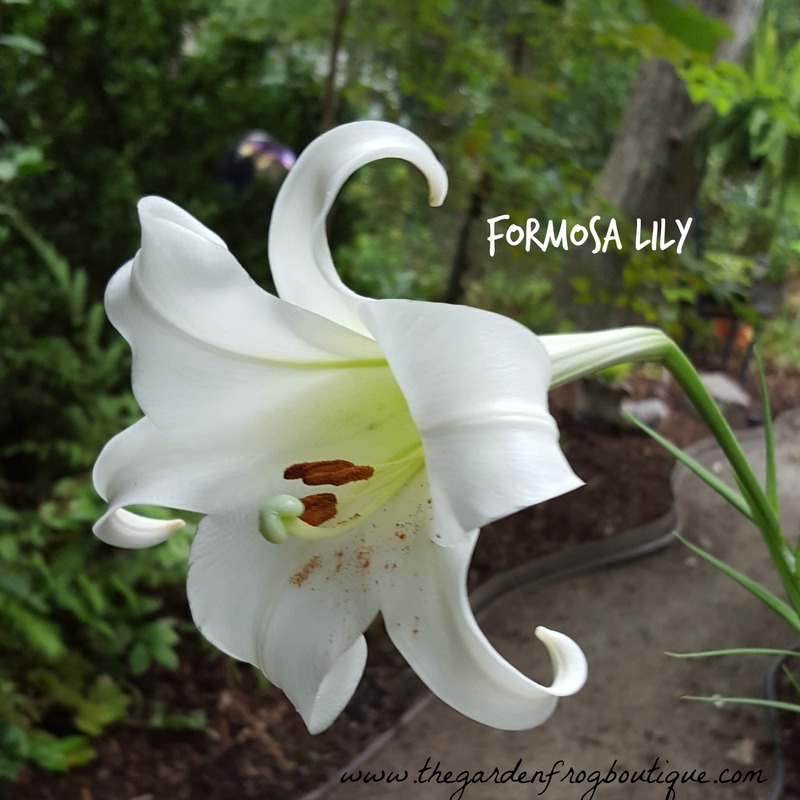 He also added the Formosa Lily wants moist but not wet soil in full sun or partial shade here in zone 7. I knew nothing of the Formosa lily. I had to go home and read more about it and discovered it is native to the island of Formosa in Taiwan and it is almost extinct there now! There is contradictory information about the zones with some sources I read say 5-8 and others 6b-9. So if you are in a colder climate I would protect it from the harsh winter temps. The Formosan lily blooms late summer and grows upward to 7 feet tall in the south where the growing season is longer. In colder climates of zones 5 and 6 it will bloom early autumn and I highly suggest planting it in full sun. In the colder zones this is a short lived perennial (or biennial) and so you may want to dig the bulbs up and try to store them in a colder garage or shed where they will not freeze below 10 degrees and plant them early spring. Or let them reseed and see what happens. Either way, only good things come out of letting nature fill your garden with blooms. This beautiful white Lily spreads by seed or bulbs which need the cold weather of winter in zones 7 & 8 to go dormant and rest. Anyone in zones 9 and up will need to dig up the Formosa lily bulbs and store them in the refrigerator to mimic winter’s cooler weather. I have collected seeds for 2 years now and in my new garden I will sow a backdrop of these fragrant beauties behind all my coneflowers, sedum, and black eyed susans. It is recommended not too cut too much off the stem because the stems are needed to make food for the bulbs the following year. I never cut down my lily stems and let them die back naturally and let nature do her work. This can be a prolific reseeder in the garden so cutting off the flowers before they dry and release the seeds may help contain them. Have any questions or want to talk gardening? Thanks for stopping by and reading. If you have the Formosa Lily I would love to hear from you on any tips. Gardening is a learning experience and one that I love to share! Don’t forget to check out other gardening posts here at The Garden Frog. It will be fun to see how many plants those seeds produce. 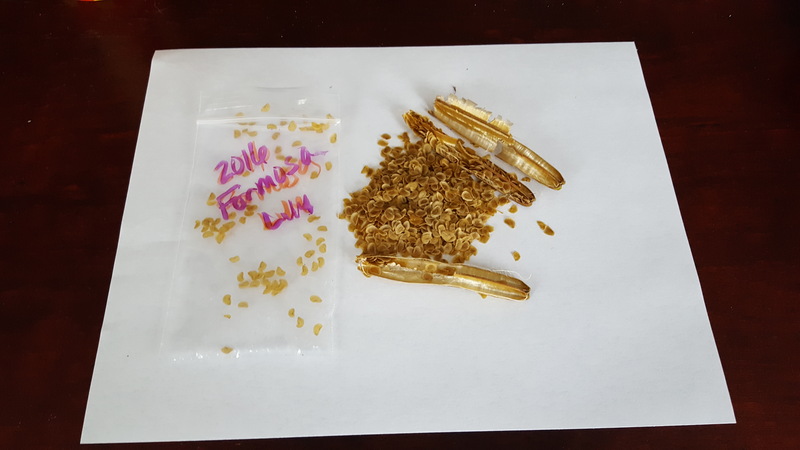 Usually when plants produce that many seeds, they are very proficient. I cannot wait either! because I imagine what a whole line of tall white flowers looks like and smells like! heaven!